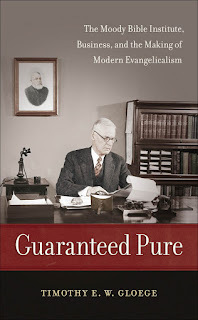 Tim Gloege's recent book, Guaranteed Pure: The Moody Bible Institute, Business, and the Making of Modern Evangelicalism (UNC Press, 2015), details the ways that business shaped the evangelicalism of the Moody Bible Institute in the late nineteenth and early twentieth centuries. This book intervenes in several different subfields, including the history of fundamentalism and evangelicalism and the history of religion and capitalism. But before I get to the historiography, first the history. Gloege argues that Moody Bible Institute, including evangelists D. L. Moody, R. A. Torrey, and James M. Gray, as well as businessmen such as Cyrus McCormick and Henry P. Crowell, "weaved disparate ideas drawn from business and religion into a compelling, if unstable form of evangelical Protestantism" which he terms "corporate evangelicalism." Corporate evangelicalism was an attempt to create a "respectable evangelicalism" which could resolve the tension between evangelicals' rejection of "churchly" institutions and the very real excesses of unbridled individualism. By being respectable, evangelicalism could appeal to the middle classes, even if it lost its ability to appeal to the working classes. Being businesslike was a way of being modern without becoming a modernist. According to Gloege the development of corporate evangelicalism fell into three chronological stages. First, the nineteenth century featured a "compulsory denominational identity" against which evangelicals like Moody rebelled. The evangelicals, borrowing techniques from the businesses they ran or that funded them, instead built the Moody Bible Institute into a "branded institution." This brand guaranteed the purity, in terms of doctrine, practice, and associations, of the students it educated to be Christian workers. When the oatmeal magnate Henry Crowell took over the Institute he instituted stricter rules about dress and deportment, and segregated the living quarters of African American students off campus, in order to appeal to the respectable middle class. However, neither Crowell nor any other institution could entirely maintain their control over celebrity evangelists who had their own brands, and so we are left today with a "present in which the brand alone is all that matters." In U.S. religious history, the "free market in religion" has often been a thoughtless turn of phrase, an intellectual crutch to refer to the way American religion functions without any attention to chronology or the specifics of the metaphor. In Gloege's work, though, that connection is neither metaphorical nor vague, since he details the ways that the Moody Bible Institute borrowed business practices. As Gloege writes, "many evangelical professionals considered business practices of all kinds to be uncontroversial reservoirs of spiritual insight." I have already mentioned Gloege's argument about the branding of corporate evangelicalism, but he makes connections to other business practices as well. The first half of Guaranteed Pure takes up the theme of Christian work. Gloege makes the insightful (and new to me, at least) observation that Moody was as much concerned with getting people engaged in Christian work in their own right as he was in saving souls. Though premillennialists like William Blackstone thought of Moody's Chicago Evangelization Society as a premillennialist, fundamentalist institution, Moody thought of it as an attempt to reach working classes and train Christian workers after the Haymarket riots. Moody was wished to be a bridge between classes, and his Christian workers were supposed to reach the lower classes with the gospel. But Moody's connections to and identification with the upper classes, as well as his obsessive concern for respectability, meant that Moody lost touch with the working classes, and more often than he wished he ended up preaching primarily to those who had already been converted. Another borrowing from business (and law) came from contracts. Both Reuben A. Torrey, Moody's successor at the Institute, and the Keswick theology which came to dominate the institution relied on a contractual reading of the Bible. Gloege's explication of how Torrey read the Bible is one of the most fascinating parts of this book. For Torrey, "the Bible served as the contract between the believer and God, specifying the terms for entering into the relationship." The Keswick theologians "taught that a believer's relationship to the Holy Spirit was contractual, that it required complete submission by exchanging one's will for God's, that the special relationship could end at any time, and that it produced spiritual power." Torrey took every part of the Bible as speaking to him individually. This produced tremendous certainty that God had blessings in store for him, but also tremendous uncertainty about whether the absence of blessing meant that he had broken his obligation to God and been removed from God's special favor. For a time Torrey did not take a salary and refused to undertake any kind of debt out of the belief that he had to rely solely on God's provision. This left Torrey with a comic problem. Should he pay his rent in advance so as not to be in debt to his landlord? But if he paid in advance, was not his landlord in debt to him? It also led to tragedy. Taking the words of the Bible as literally promised to him, Torrey practiced faith healing. When his daughter fell ill he at first refused medical help, calling for a doctor only when it was too late. His daughter died. Yet Torrey did not blame his daughter's death on his failure to call the doctor early enough, but on the fact that he had called the doctor at all. When another daughter fell ill, Torrey did not call a doctor and her eventual recovery seemed to vindicate his faith. As Gloege puts it, "Torrey's God was personal, but the process was mechanical." Gloege spends the second half of the book on consumption and advertising, where the central figure is Henry P. Crowell. Crowell made his money despite the low margins on oatmeal by packaging it in two-pound containers instead of bins, guaranteeing its purity with the image of a smiling Quaker holding a sign that said "Pure," and above all creating demand for oatmeal through advertising. Crowell turned to advertising God the way he advertised his oats, making him respectable against the excess individualism of Pentecostalism (including Torrey's faith healing). Crowell "could create a new 'respectable' middle-class evangelicalism as long as its theology imitated the conventions of advertising and its believers acted like modern consumers." Corporate evangelicalism centered on consumer choice fundamentally changed the nature of religious affiliation: "both advertisers and evangelists were tackling the same problem of individual human choice, and both groups welcomed any art or science that gave them an advantage." For evangelicals, "consumer culture thus encouraged a definition of what it meant to be authentically human that placed a particular emphasis on choice." Evangelicals turned from Moody's producerist ethic to a consumer's ethic. Unlike theological liberals, who were more focused on community than individual salvation and on social science than on contractual readings of the Bible, and unlike "churchly conservatives" who regarded God's Spirit as working through the institutions of the visible church, Gloege's evangelicals came to focus on the types of institutions that appealed to them. "The act of submitting to God" became "part of a consumer transaction that provided freedom from sin rather than part of a relational state of divine employment." I find Gloege's case for a corporate evangelicalism is convincing. His contribution to the current outpouring of studies of religion and capitalism is the way he explicates how a particular kind of evangelicalism borrowed from corporate practices and in how he thinks through the influence of this form of Christianity on the middle and working classes. This is a book that takes class seriously. Because Moody Bible Institute had few African American students and even fewer once they instituted residential segregation, the book account of race less. In that way Gloege's book is like Matthew Sutton's American Apocalypse (both books have the term "modern evangelicalism" in their subtitles) which argues that "the color line always trumped theology." Still, the book that kept coming to my mind was Wallace Best's Passionately Human, No Less Divine, which is also set in Chicago in roughly the same time period but which focuses on black migrants from the rural south and their storefront churches. One might fruitfully compare the business practices of respectable white evangelicals with the economic and religious experiences of their African American neighbors in the same city. 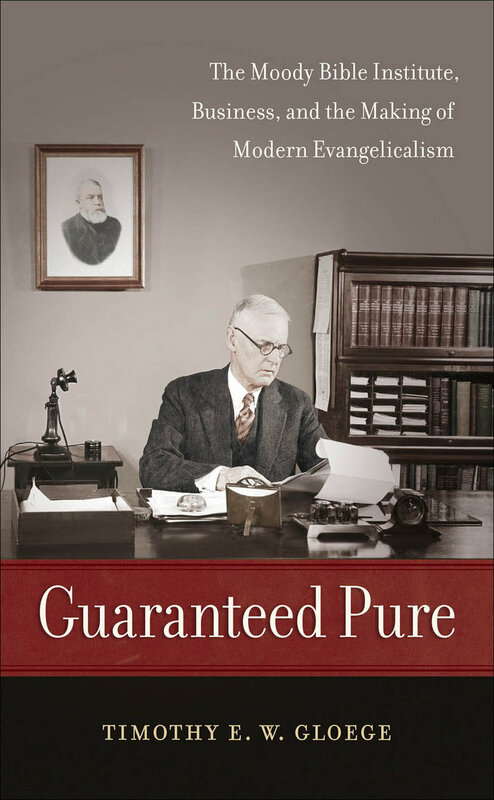 Guaranteed Pure is also deeply engaged in the historiography of evangelicalism and fundamentalism, and can be most obviously compared to Sutton's American Apocalypse, Matthew Bowman's The Urban Pulpit, and, a generation before them, George Marsden's Fundamentalism and American Culture. On the one hand, since it focuses on just those people in the ambit of the Moody Bible Institute, this book is far narrower than Matthew Sutton's more expansive (and also very good) history of modern evangelicalism. But in many ways the book is richer, since Sutton's use of premillennialism as the defining feature of modern evangelicalism shunts the Keswick theology, Spirit baptism, and contractual readings of the Bible to the background. Their aims are of course different, but Gloege's framework seems better able to account for those practices, as well as the churchly conservatives whom Sutton consciously excludes. It might be too much to expect, but now that Gloege's book is published perhaps we can do away entirely with the tiresome "liberal" versus "conservative" dichotomy when discussing American religion. Gloege instead proposes that we think of Protestantism along two axes instead of one: churchly versus evangelical, depending on whether one favored denominations or individuals, and liberal versus conservative, depending on how one approached the Christian tradition.1 This terminology fits well, I think, with the kinds of liberal evangelicalism that Matthew Bowman writes about in The Urban Pulpit and in the distinction between premillennialist and churchly conservatives that informs Sutton's American Apocalypse. Guaranteed Pure makes a contribution to these varied fields and even attempts to revise the terminology of American religious history. But it manages to do so while telling a coherent narrative focused on a handful of individuals and an institution in Chicago.